Although rumours were somewhat squashed at the beginning of the week, it now seems the saga of the Facebook Phone rumbles on, and this time with a bit more clout. Rumours this morning suggest that Facebook is working with US producer INQ mobile to produce a branded handset which could be released on AT&T in America and on Three here in the UK. Strangely they also suggest that the phone will be available in Europe before the US, mainly due to INQ’s ties with the Carphone Warehouse, with a release date as soon as the first half of 2011. INQ Mobile do have previous with Facebook, selling exclusive phones with built in Facebook features, so it makes sense for them to be named together. Currently around a quarter of users on Facebook log in using their phones, so the move makes sense. 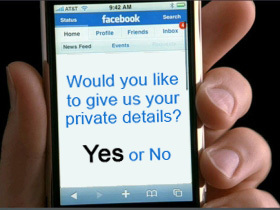 However with previous privacy issues most consumers must have that in the back of their minds? In a recent survey of UK consumers by website MyVoucherCodes, nearly a quarter of Britons out of the 1,485 people surveyed would purchase a Facebook-branded phone. Where they found these stupid people is beyond me, but who knows. Image thanks to @warrengroom and original source, bloomberg.